Josh Levin is the president of LympheDIVAs, a company that makes fashionable compression garments for people with lymphedema. 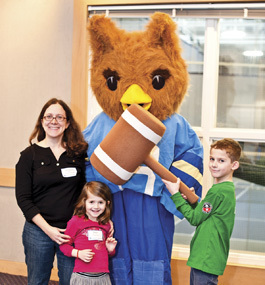 OLLIE AND FRIENDS: Amanda Pressman ’98 and her children, Maya and Gabe, pose with Ollie the Owl at the annual Alumni Family Basketball Day. More than 200 alumni, family and friends cheered on the men’s and women’s basketball teams. Lenny and Amy Greenberg Bard, both ’79, chaired the event.